ALBUQUERQUE, NM—The ABQ BioPark Botanic Garden opens the first dragonfly sanctuary pond in the United States on Friday, September 2 at 10 a.m. The new exhibit will be featured during Dragonfly Discovery Day from 10 a.m. – 2 p.m. on Saturday, September 3. View dozens of these dazzling insects at the Botanic Garden and enjoy learning more through displays and hands-on discovery stations about dragonflies and damselflies. The new Dragonfly Sanctuary Pond features aquatic habitat perfect for attracting and breeding dragonflies and damselflies. Plants for perching grow around the pond, allowing guests to view and identify several species of dragonflies at once. A stream bubbles into the exhibit from a rocky desert landscape, and a deck overlooks the vibrant scene. A stunning glass mosaic depicting summer insects shimmers on the north wall of the courtyard. The mosaic by artist Laura Robbins will recognize NM BioPark Society donors. The Dragonfly Sanctuary Pond is the first public part of the BioPark’s BUGarium, a multi-faceted exhibit that will give visitors a fly’s eye view into the world of insects. The Arthropod Rearing Laboratory has been in operation behind-the-scenes since April of 2009. Dragonfly Discovery Day features hands-on activities and fun facts about New Mexico’s dragonflies and damselflies. The event is the first of a series in the BioPark’s Bug Blitz. Friday’s exhibit opening and Saturday’s Dragonfly Discovery Day are included with regular admission. The BioPark is an accessible facility and a division of the Cultural Services Department, City of Albuquerque, Richard J. Berry, Mayor. For more information, visit www.cabq.gov/biopark or call 311 locally or (505) 768-2000 (Relay NM or 711). 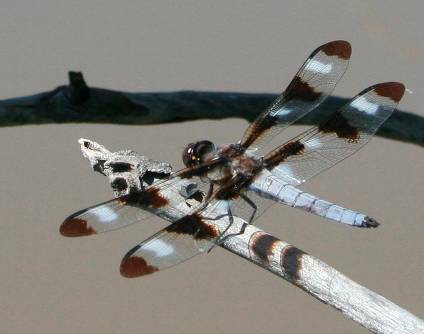 Caption: A twelve-spotted skimmer overlooks the pond. Photo by Katie Mast/ABQ BioPark.